Brightside Electric is a family owned and operated business that has served the community for over 10 years and has built a great reputation among its customers. Brightside Electric provides residential, commercial, and agricultural services to Overland Park, Olathe, Leawood, Shawnee, Lenexa, Spring Hill, Gardner, and Miami County, KS, as well as surrounding communities. We cater to all residential, commercial, and agricultural electrical needs. A licensed electrical professional handles every job to ensure the safety and quality of our work. Our job is never finished until the customer is satisfied. 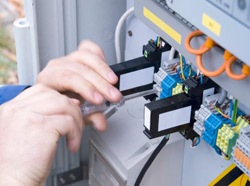 Call us at 913-669-8719 for more information on our electrical services. Brightside Electric provides electrical services to Overland Park, Olathe, Leawood, Shawnee and Lenexa, KS as well as the surrounding communities.